Pied Piper’s space saver app is online and reaches the top 500 apps on the Hooli store. Richard is contacted by Stewart Burke, a retired attorney that lives off royalties earned by “patent trolling” musicians and tech companies for intellectual property of their work. He asks Richard for a licensing fee of $20,000 as he owns the patent for the “storage of media files on a network”. Even if this is hardly enforceable, the costs of paying him are significantly lower than paying an attorney to dispute this in court. When Richard tries to convince some other top 500 apps owners to do a joint litigation against Burke, the plan backfires as Burke informs him that the other companies have reached out to him to settle at a discount rate and if Richard wants to do it too it will now cost him $300,000. Richard responds by pretending to use his old Pied Piper app to find a flaw in one of Burke’s previous copyright claims, regaining full control of his patent without having to pay him. However, the failed joint litigation deal was drafted by Ron Laflamme, who charges Richard a fee of $22,000 for it. 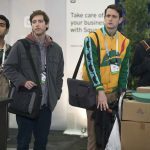 Meanwhile, Jian-Yang buys a $14,000 intelligent refrigerator, which Gilfoyle obsesses over trying to hack it, eventually using Pied Piper’s former mainframe ‘Anton’ to do it. Keenan Feldspar signs with Bream-Hall, but Monica and Laurie avoid hiring Erlich by giving him a generous finder’s fee. Erlich has already spread news across the valley that he is employed by Bream-Hall and begs them to stay for half the money they are giving him, which they accept. Ed Chen invites him to a basketball game, but when Erlich gets to Oracle Arena, he finds out that he’s supposed to play for Chen’s team. Trying to fit in, he buys a hoop and falls off the roof trying to install it while standing on an open garage door, breaking his leg in the process.